hen it comes to professional software and some of the latest game releases like that require hardware filling and I bet that you will not be that eager if you had to enjoy them on a laptop. But what about a gaming machine, one that really doesn’t fall behind most powerful desktops. That’s right this video review will be all about power, quality and high-performance hardware. Lenovo IdeaPad Y500 is an extremely powerful mobile computer that stands out with great potential no matter what kind of heavy applications you challenge it with. The 15.6’’ FullHD display provide 220 nit brightness level. It provides a great visual experience having in mind that this laptop is a wonderful machine for photo and video editing applications. Your work process will not be disturbed by any annoying light reflections thanks to the anti-glare 16:9 widescreen display. This gaming machine comes loaded with 3rd generation IntelCore i7 @ 2.4GHz with 6MB cache. The operating memory options are 2 – 8 and 16 GB DDR memory. This serious on-board equipment is accompanied by NVIDIA GeForce with 2GB that supports the latest DirectX11 games and intensive HD video editing. The sound is excellent and is a wonderful hardware finish. Тhe JBL speakers feature Dolby Home Theater 4 that provides full impact surround sound. NVIDIA GeForce with 2GB that supports the latest DirectX11 games and intensive HD video editing. The keyboard is definitely a distinctive feature here. It is of island style and the keys have ergonomic curved corners which are elegantly underlined in red. There is a numpad on the right side, which is a perfect addition to the gaming purpose of this powerful machine. As you can see the speakers and the keyboard have an impressive red edging lines that make a wonderful addition to the sturdy black magnesium case. The design features sharp edges which creates an aggressive overall appearance. The integrated 720p HD webcam and the dual digital array microphone guarantee crystal clear audio and video webchat. The keyboard has what it takes to provide the ultimate control over all the functions and applications. The case periphery features a Blu-Ray disk drive, an HDMI out, 2 USB 3.0 ports and 1 USB 2.0 port. Its connectivity abilities also include 6-in-1 card reader and VGA out. The storage capacity provides plenty of space – 1TB at 5 400 rpm. The 6-cell Li-Ion battery guarantees up to 3 hours of work according to Lenovo’s official product details. Lenovo Energy management technology minimizes power use and protects battery life. This high-performance laptop weighs the considerable 2.7 kg. 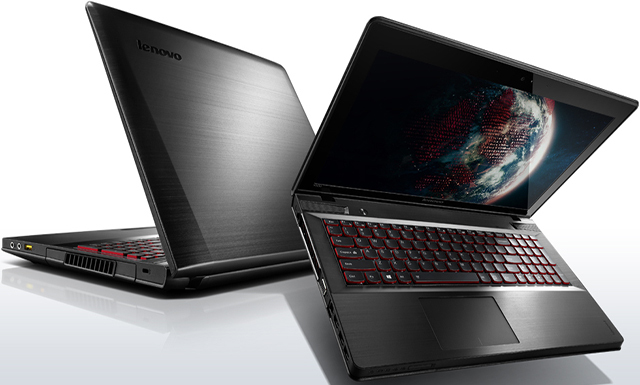 Lenovo offers IdeaPadY500 with the brand new Windows 8 platform. Have no more concerns when running intensive applications and games, just enjoy the smooth performance.